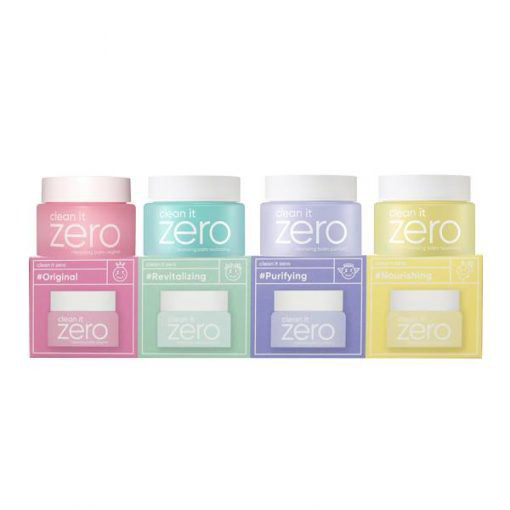 BANILA CO Clean It Zero Special Kit comes with all four Clean It Zero oil cleansing balms: Original, Revitalizing, Purifying & Nourishing balms, in miniature sizes! If you purchase this product you will earn 28 Points! This kit includes the whole Clean It Zero range. This is a range of cleansing balms that have a sherbet texture which melts into a cleansing oil once you apply it to your face. They effectively remove stubborn makeup, dirt and sebum deep within your pores in addition to rinsing off without any oily residue. For even better results, follow with a water-based cleanser. Whether you’re a super fan of Banila Co or just super curious about the cleansing balms and which one suits your skin best, this kit is for you! The miniature sizes are perfect for travelling as well as for sampling before committing to the full sizes. The Banila Co Clean It Zero Special Kit is our cutest and most irresistible skincare kit to date! Don’t need the whole range? We also have available the Banila Co Clean It Zero Special Duo. Contains Papaya Extract, Acerola Extract (rich in Vitamin C) and Vitamin E to cleanse, brighten and moisturise your skin. Great for all skin types. Uses Resveratrol, Vitamin E and Grape Seed Oil to remove skin impurities whilst also keeping your skin plump in addition to protecting it from ageing. Recommended for anti-ageing. Enriched with Centella Asiatica Extract, Licorice Root Extract and other natural ingredients to calm sensitive, easily irritated skin when cleansing; leaving your skin clear and pure. Recommended for sensitive skin. This formula is infused with Ginseng and Royal Jelly Extract to cleanse all dirt, impurities and makeup from your skin as well as to provide long lasting, deep moisture. Recommended for dry skin. Find the full sizes of BANILA CO Clean It Zero range here. Apply an appropriate amount of product onto a dry face. Add a tiny amount of water while massaging to emulsify the oil and continue to cleanse. For the full ingredients list, please see the individual product pages for each oil cleansing balm.